Halloween is not just about trick-or-treating these days! Many restaurants have announced special deals with free or cheap kids’ meals starting October 30th! If you’re looking for a ghoulishly good deal, here are 5 more Halloween Deals that are serving up freebies and discounts this Halloween. But for some deals to apply, you have to be in costume! Families who dine at Applebee’s Neighborhood Grill and Bar restaurants on Halloween will receive up to two free kids’ meals with the purchase of each adult entrée. Children 12 years and younger can choose from a variety of entrées from Applebee’s Kids’ Menu, accompanied by their choice of a side dish, and juice, regular milk or chocolate milk. Make sure to give your local restaurant a call to make sure they're participating. 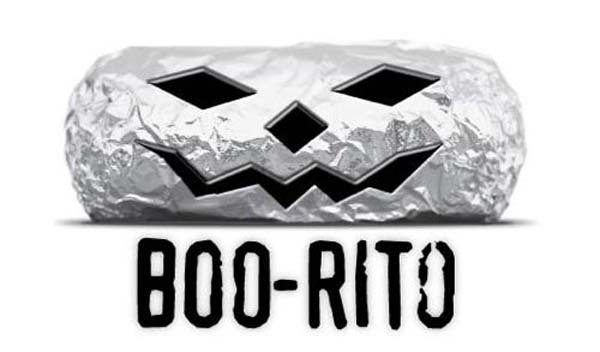 For customers in costume on Halloween, Chipotle Mexican Grill is offering $3 burritos — or "Booritos" — and more. Starting from 3 p.m. to close on Oct. 31, Chipotle will charge people in costume $3 for "Boorito" burritos, bowls, salads and tacos. Separately, the company is also offering consumers a chance to win free burritos for a year by texting "BOORITO" to a designated line ahead of Halloween. Not only is IHOP offering free food on Halloween, they're making it totally okay for kids to play with their food. From 7am through 10pm, kids ages 12 and under can get a free Scary Face Pancake and design their own freaky frown using toppings like strawberries, whipped cream, Mini Oreos and candy corn. Scary Face Pancakes are available now through October 31 at participating Macon area restaurants. Enjoy candy corn pizza (pizza with garlic mozzarella and sharp cheddar to resemble the traditional Halloween candy) at Chuck E. Cheese's this Halloween. The specialty pizza will be sold with two servings of candy corn through Oct. 31 with free slices given away on Halloween from 4-8 p.m. while supplies last. Also, kids get 50 free tickets when they stop in wearing their Halloween costumes.